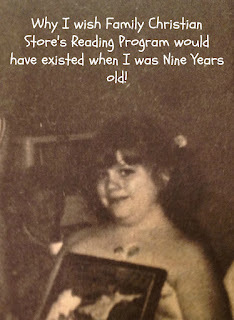 Books, Bargains, Blessings: Why I wish Family Christian's Reading Program Existed 30 years ago! Why I wish Family Christian's Reading Program Existed 30 years ago! FTC disclaimer: This is a sponsored post by Family Christian. It contains affiliate links. All opinions are my own. I always loved to read. I always hated in first grade we had to circle all vowels and color all pictures on our worksheets every day before we could go to the reading nook and read. There was this girl, who also shared my first name who was quicker at that, and she got to go to the reading corner more often. I'd look on with envy as she was there with an open book when I had to color pictures. To make matters even worse, she had a cooler last name than I did because it came before mine in the alphabet. She got to read, and she was Jennifer "1". Add in the fact that my last name was Short, there was no way I wanted to go by Jennifer 2 Short. But first, the child has to read the books. This would have been no trouble for me as a child. I loved the Mandie books, and I can remember spending a summer afternoon reading The Sugar Creek Gang and the Swamp Robber. My absolute favorite books as a child were the In Grandma's Attic Series. I have shared these with many a girl in my life over the years. If these suggestions are a little too old for your child, I adored the Arch Storybooks when I was a child. They retell Bible stories with great pictures and they are in rhyme! There's time to discover new favorites such as Tricia Goyer's Prayers that Changed History. This book introduces children to heroes of the faith and how their prayers made a difference. What an encouragement for kids! Now if you'll please excuse me, I haven't read my Grandma's Attic books in a few years and it is a summer day, and I want to re-read about the time that Mabel made the facial mask from a magazine she came across. That sounds like a fun program. The only Family Christian around here is 30 minutes away though. I love your story from when you were a kid. Isn't it funny the things we remember? Jenn, this is great! Lots of great information here, as well as your youth (I cried!) but, thanks for the great information and for all of the links back to FC, I was able to search some stuff out quicly!